This stirring film takes up where Chariots of Fire left off. 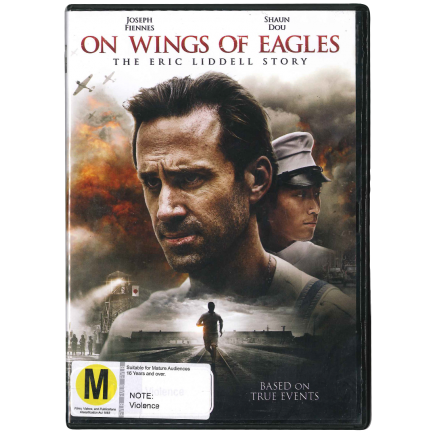 Having won gold for Britain at the 1924 Paris Olympics, Scottish athlete Eric Liddell (Joseph Fiennes) returns to his birthplace China, to follow in the footsteps of his missionary parents. Liddell's life there, serving as a schoolteacher and starting a family, is overshadowed by the Japanese invasion in 1937, which brings great suffering to the Chinese people as another World War looms. Liddell and his friend Xu Niu, a street-smart resistance fighter, recognise the increasing danger, so Liddell sends his wife, Florence, and their two daughters to safety in Canada. Duty-bound, Liddell stays to minister to the civilian victims, continuing to serve and inspire even after being imprisoned in a Japanese internment camp. In conditions of incredible hardship, Liddell's example of patient endurance, love, and selfless dedication to the needs of others will leave an immortal legacy of hope - one that continues to this day.